More short fiction about Karl, who rediscovers his favorite childhood author and wonders why he ever read his books in the first place. So we all made it through post-midterms week without flailing around like a squid in soup. Dr. Corddry calls it suffering week. I guess all the professors go out to bars downtown on this Friday to celebrate the number of students dropping their class or something. I didn’t do too badly, but I really need to work on my grammar, according to Lindsey, in the Honors class. My paper was covered in red marks, like it was knifed. I guess the thing to do on a Friday night for a typical NAU student is to go wander around downtown so I went downtown with Eddie and Abigail. We went out to this place called Heritage Square, where a bunch of hippies play music and sell magic crystals and beads and vortex passports. It’s a weird place on a Friday night. 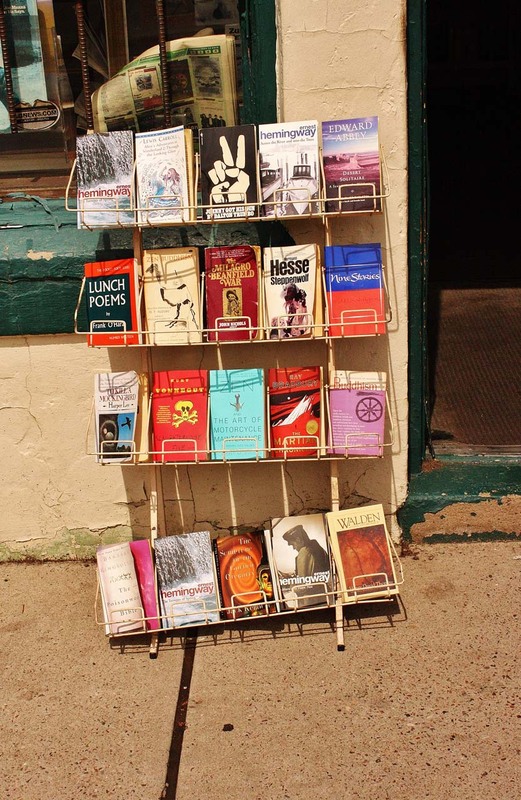 We went into this tiny little bookstore that had classic volumes of books set up out front. At first, I didn’t think it was worth checking out, but I saw a first-edition copy of one of the great works of English literature, The Android City of Glariton 3 by Calgary Smith, sitting in the shelf. That’s when I had to go in and see if they had more Calgary Smith novels. Eddie and Abigail hadn’t ever heard of him. I was shocked! I thought everybody knew about Calgary Smith. He’s one of the greatest writers ever. I read almost everything by him back in high school. I almost got a signed copy of one of his other novels, Ginger Bates and the Crawling Brains, at a bookstore in Pocatello run by a drunk guy who plays guitar, but a goth from marching band beat me to it. That’s when I said I’m not scared of nothing, pushed the door open, and went into the place for special patrons only. Inside was this dimly lit room of bookshelves with all the super-secret rare first editions, editions with flaws, unauthorized reprints, and other books that looked more valuable than everything I’ve ever owned put together. We went in, and I found almost a whole shelf of used copies of Calgary Smith’s Ginger Bates series, and the Glariton 3 series. They even had a book I’d never been able to get my hands on, the cross-over novel he could never afford to publish because for some reason he went bankrupt at like a really early age and had to work in a coal mine or something. It was called Ginger Bates and the Rogue Spacecraft, which was published just before his death. I told Abigail and Eddie about it, and they read the first page. “The hell are you talking about? This guy’s brilliant!” I said. I spent all of my allowance on his books and had them all lined up at home. Granted, I hadn’t read any for a while, cause I got into this other series, but I can’t remember the name, House of Thrones or Game of Cards or something like that. “Karl, this is the worst writing I’ve ever seen,” Eddie said. “Yeah, well, I guess you’ve never read any of your own papers, then.” I looked at the special patron books and saw a bunch of copies of John Steinbeck novels, some really vintage comic books, a copy of V for Vendetta signed by the author. If Calgary Smith’s novels were so bad, why were they here with all the good stuff? I grabbed the book from Eddie and read the first page. Then I read it again, then looked at the cover to see if it was the right Calgary Smith and not an evil twin with an identical name, then read the second page. I flipped through the book and found some notes in the margins. They were revision notes, I think. One note said “Plot hole 37, see page 109.” Somebody found 37 plot holes? At the very back, I saw a long paragraph about giving up on writing, and it was signed by Calgary Smith! That’s why it’s in the special patron section, because it has his own notes about how he’s going to give up on writing and live in a commune in the Yucatan with some escaped coal miners, or whatever he wrote. Eddie and Abigail tried comforting me. It’s not like I was diagnosed with a terminal disease or anything, but I appreciated it anyway. We left the special patron section and wandered around the bookstore some more, and then to make me feel better they bought me this weird piece of local art at an art gallery next door. It was a little bust of John Steinbeck made of shells. I couldn’t tell it was him, but it was cool to look at. It actually looked like those aliens from that movie with all the aliens, whatever it was called, like Predator Vs. Predator or something. Anyway, that was my first time in downtown Flagstaff. I met like forty-seven hippies that night, too, and lots of hobos playing didgeridoos. That’s my life now. I think I’m gonna start reading Autumn Bartlett’s copy of The Book Thief. It’s time I had a new favorite author. Good luck with your own Friday nights and creepy shell statues. This entry was posted in Fiction, Karl the English Major, Writing and tagged book store, English Major, Flagstaff, NAU, Sci-Fi, science fiction, Short Fiction, short story, vignette, writer on August 14, 2014 by keeneshort.